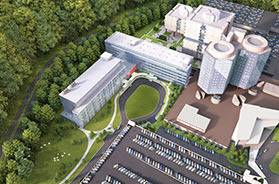 Stony Brook Medicine has embarked on a $423 million expansion project, consisting of a new Medical and Research Translation (MART) building and Hospital Pavilion, including a new Stony Brook Children’s Hospital. The MART is made possible by New York State Governor Andrew M. Cuomo and the State University of New York under the leadership of former Chancellor Nancy L. Zimpher, through a $35 million NYSUNY 2020 Challenge Grant, and $50 million in support through a historic $150 million gift from Jim and Marilyn Simons and $53 million in support from New York State Senators Kenneth LaValle (R-Port Jefferson) and John Flanagan (R-Northport). With 245,000 square feet, the eight-story MART will be located on Stony Brook University’s East Campus, home of Stony Brook Medicine, adjacent to the hospital and Health Sciences Towers. The MART will be a home for understanding the basis for human disease, where scientific discovery will be translated into clinical research and where promising patient results can be turned into FDA-approved healthcare diagnostic and treatment options. 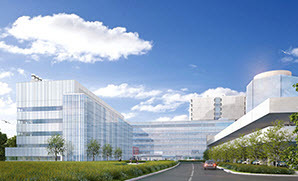 As part of its core mission, the MART will be devoted to cancer research and care, including the new location for the Stony Brook University Cancer Center. The MART will also house advanced biomedical imaging and biomedical informatics, including a PET/CT scanner..
With 225,000 square feet, the 10-story Hospital Pavilion will contain 150 inpatient beds. Four floors will be dedicated to a new Stony Brook Children’s Hospital. The pavilion will also include a pediatric intensive care unit, adolescent unit, procedure suite, hematology/oncology unit and medical/surgical units. The complex also features an expanded imaging department, 12 new classrooms and a 300-seat auditorium. Both buildings are expected to open in 2018. Cancer patients who reside on the South Fork of Long Island have had to travel considerable distances to receive therapy. Construction began in June 2017 on a 14,000 sq. foot, two-story building on County Road 39 in Southampton that will house the South Fork’s first radiation oncology unit. The facility will be equipped with a state-of-the-art linear accelerator, the type of technology most commonly used to administer radiation treatment, services not available at the Hospital. The center will also feature 14 stations where patients can sit and relax while undergoing infusion therapy, a combination of radiation and chemotherapy. Support services for cancer patients will also be available.